This sthalam is one among the Thirunaangur Divyadesam and lies in Thirunaangur in Tanjore district in Tamil Nadu. It's about 5 miles away from Seerkazhi. Bus facilities are also available. 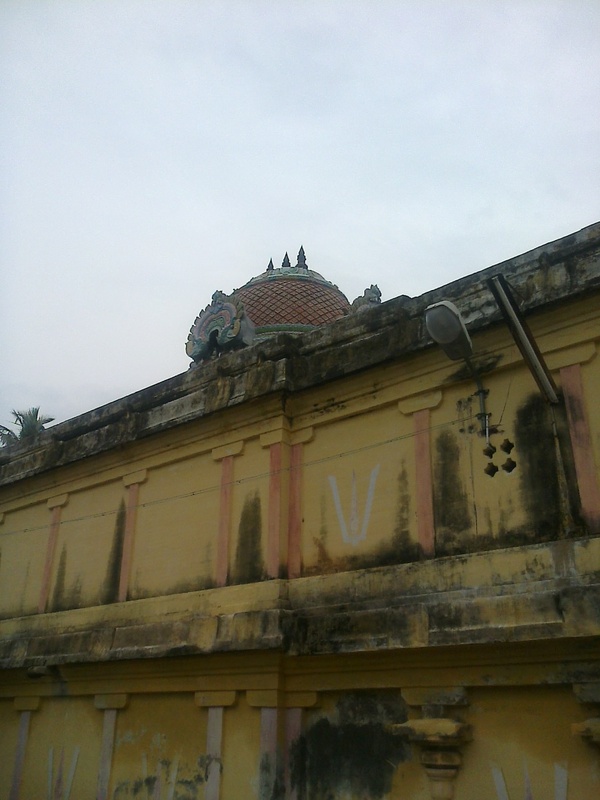 This temple has 2 prakarams. Chola inscriptions from the 10th century (Parantaka) and from the Nayak period are seen in the temple. The Indra pushkarini tank is located across from the temple. Legend has it that Indra worshipped Vishnu here. It is also believed that Badrinarayanar came down here to bless Matanga Muni. Nanda Vilakku means the lamp which gives light continuously. 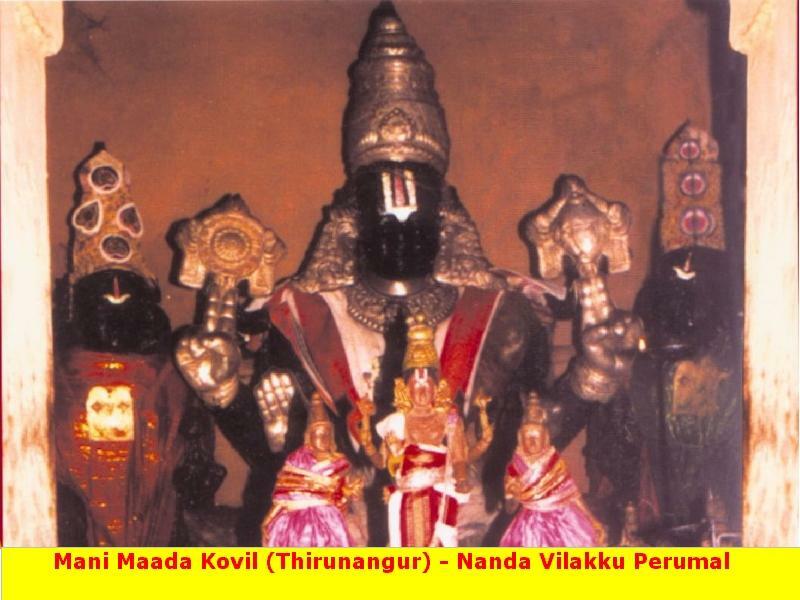 Here the perumal stands as this Nanda Vilakku giving the Pranava Gyana oli ie Pranavam means the word "Om" which is the key sound of the whole universe. Ajaykapathan, Aahirputheyar, Binanai, Roodhar, Pithuroopar, Thriyambakar, Maheswarar, Virushakabi, Shambuvahanar, Easwarar all the above 10 are known as Ekadasa Rudhirar. Ajaykapathan was once the carrier of Lord Shiva who was having 4 mouths, 1000 shoulders, Karala Vadhanam, ears with shell earrings and 100 legs. Aahirputheyan is the son of Maharishi Boothan and Surabi. Binaki is actually a bow which was formed by Lord Indra. Once Kanva Maharishi who brought up shakuntala was in a deep prayer and was covered by Sand dunes. Bamboo trees started to grow on the top and seeing the finest quality of these Bamboo's, Lord Indra made 3 bows out of them. He named the first one as Kandibam and kept it for himself. The other one was named Shargam and was given to Lord Narayana and the third one was named Binaki and was given to Lord shiva. Maheswarar has the body and ornaments as Lord Shiva but is of white colour. As Lord Narayana gave his dharsan to Lord Shiva who was received from the sin of killing Lord Brahma. Narayana gave these Ekadasa Rudhirar's too his special dharsan. Once saint Dhurvasan gave a garland which was used in the worship of Godess Lakshmi to Lord Indira. But he took the garland carelessly and put it on his Elephant Iravadham. The garland was smashed under the feet of this Elephant. The saint got angry and cursed Lord Indra that all his wealth would disappear in the sea. So happened and on a particular day all the Deva's churned the sea and the next day they got Godess Lakshmi's blessings. So that particular day of churning was named as Ekadasi and the day next as Dhuvadasi. So after regaining his wealth, Lord Indra got the dharsan of Lord Narayana at this place. As Lord Indra and the Rudhirar's got the Lords dharsan, the pushkarani known as Indra Pushkarani and Rudira Pushkarani. As the Lord here vibrates all his powers as Pranava without stipping, like a Nanda vilakku the Vimaanam here is Pranava Vimaanam. All the 11 Divyadesams of Thirunaangur was created to receive Lord Shiva from his Brahma hati dhosam. It's been said that in a war between Lord Shiva and Lord Vishnu. Lord Shiva throwed his Tirisoolam (his weapon) on Lord vishnu and he took it as his Thiruman (Symbol in his forehead) and Lord Vishnu once held Lord Shiva's neck tightly (while he drank the poison which came from the Thriuparkadal) and the poison stood there and Lord Shiva was named Neelakandan thereafter. By worshipping Lord Shiva his black throat resembles Lord Krishna's colour and while worshipping Lord Vishnu the Thiruman stands as symbol for Lord Shiva and thus these Lords are insisting unity among us. Nara Narayanar, is the form of Lord who became a student himself and a teacher himself, teaching Gnana to himself as being a student and teacher simultaneously. Lord Naryanan of Manimaada Kovil stands as a lamp which spreads Gnana to the world and Nara Narayana of Bhadrinath who taught Gnana to himself and thus both are equivalent in terms of Gnana. The above comparison was made by Thirumangai alwar in his paasuram "Nandha vilake! alatharkuariyay! Nara Narayanane....". 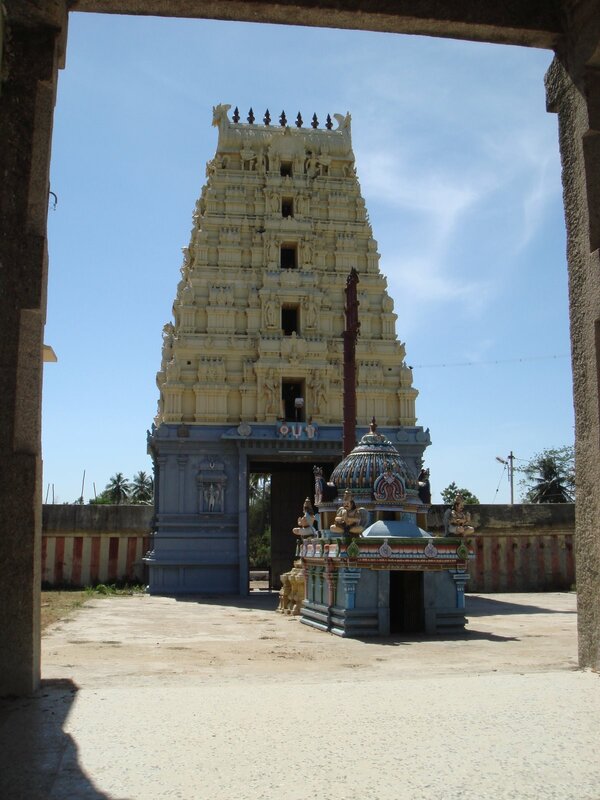 Usually the Nanda vilaku is kept in an beautiful Maadam ie a structure used for placing camps and hence this place is known as Mani Maada Kovil containing the Lord as camp in it. It is the fervent wish of every devout Hindu to visit Badrinath in his/her lifetime and have the darshan of Badrinarayana. A visit to Badrinath in ancient days used to be very tedious as the journey by foot in the Himalayas is very dangerous. However now a visit to Badrinath is accomplished more easily, thanks to modern means of efficient hill transportation. Notwithstanding this, only very few from the South can undertake a pilgrimage to Badrinath even today. Especially the elderly who, one feels, hear the call of the divine more acutely than the young and whose yearning to see the lord is arguably and generally more. Here is great news. Lord Badrinarayanan is very much a resident in Tamil Nadu, in similar majesty as in his snowy abode. It is said that Vishnu appeared here as Badri Narayanan, as in Badrinath . The huge sized deity Narayana in sitting posture as seen in Badrinath is made of Salagram stone. One another significance of this divyadesams is where the Garuda Sevai of all the perumals of the divyadesams in Thirunangoor can be worshipped by the devotees o the pradamai day of Thai Amavasya every year It is here that the 10 different forms of Vishnu from the Divya Desams in and around Thirunangur come together to be praised by Thiru Mangai Ahvaz. This is the most important festival in Thiru Nangur. We are told that all the residents of this place treat that day as a festival in their own homes and entertains all the pilgrims in their house with food and shelter. The garuda seva will take place throughout the night and devotees from all the parts of Tamilanu and elsewhere assembles here for the special darshan of all the eleven perumals at one place. From Sirkali 8 kms. Sirkazhi to Annankoil Bus Route. From Annankoil 3 kms.